Hello! Hope y'all are having a wonderful Saturday, here it was supposed to rain but instead we have sunshine. Yipppeee!! Well today I have yet another swatch from Takko Lacquer. Sadly there are only a few left to share! Takko Lacquer is a artisan polish made with Earth friendly minerals. Each bottle is hand mixed/poured and made in small batches. The polish is 5 Free and 100% cruelty free! Oh and it is "Born in the USA" ,as the bottle says, and to be more specific right here in Florida! Babycakes - a corally pink with golden shimmer and a hint of holo. First off this color is lovely! 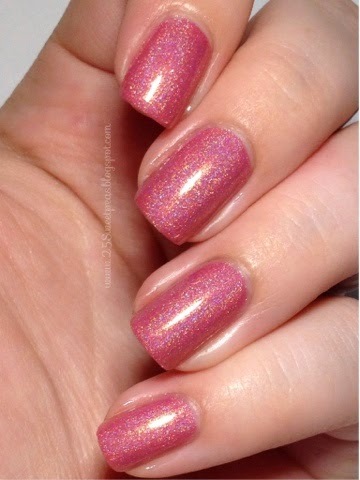 I love the corally pink and so to have one that is a holo and only takes 2 coats, well that's just spectacular! This polish went on wonderfully, and had a very nice easy to work with formula. Well I have footage of this polish, but what I use to put together the videos isn't working so well. So not sure if one will be up. That being said I will try so make sure and check later! Hope you all enjoyed this post! I know I really enjoyed this polish! It's gorgeous! So what do you all think?